Today, the global village has a lot of problems such as poverty, diseases, education, water shortage, inequality, disrepute, economic growth, energy, climate change, and ecosystem destruction. In 2015, the UN Headquarters announced the UN and the international society’s ultimate common goals to solve these problems of humankind. The 17 goals and 169 targets were adopted by 193 countries to achieve them by 2030. These goals are UN Sustainable Development Goals [SDGs]. The first 16 goals are No Poverty, Zero Hunger, Good Health and Well-Being, Quality Education, etc., and the last 17th goal is Partnerships among nations for these 16 Goals. For the cooperative exchange of the global welfare activities, the Intl. WeLoveU Foundation held 2018 Intl. 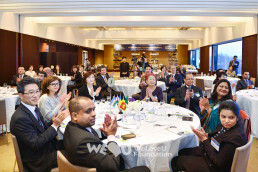 WeLoveU Meeting at Grand Hyatt Seoul Hotel on Feb. 5. At this meeting, which was held under the subtitle, “International Cooperation & UN SDGs” were present Chairwoman Zahng Gil-jah of the Intl. WeLoveU Foundation, Executive Director Lee Gang-min of the Foundation, the board, and ambassadors, diplomats, and officials of embassies from 17 countries including Ambassador of the Philippines, the Ambassador of Spain, the Ambassador of Laos, the Ambassador of El Salvador, the Ambassador of Honduras, the Ambassador of Bangladesh to South Korea, and the Chargé d’affaires of Bolivia to Korea. Chairwoman Zahng Gil-jah who welcomed the ambassadors delivered an opening address, expressing her hope that our little efforts and concern will help the neighbors of the global village have a better life. Chairwoman Zahng explained Korea’s traditional community spirit that sows three seeds when planting beans to share them with insects and birds, and leaves grains on the field for wild animals, and leaves some fruit at the edge of the branches for birds when picking fruits. Saying, “I hope this kind of love and consideration will be abundant throughout the globe,” she asked the ambassadors and diplomats for their opinions on how to implement the UN SDGs and also on how to help the global village have a better life of tomorrow. The ambassadors expressed their active support and cooperation for the future activities of the WeLoveU by signing the forms for implementing the UN SDGs and supporting WeLoveU’s activities, prepared in one corner of the meeting room. Dinner was followed in a pleasant atmosphere. The ambassadors who came from Asia, Africa, Oceania, and Central and South America shared the same will with WeLoveU to promote a better life of mankind, transcending countries and continents. One of the reasons I support WeLoveU is because its activities to help neighbors in urgent need at various angles always give me good impression and touch my heart. The second reason is because of your education support for a school in my country when it suffered damages from a typhoon by restoring the school for the students. I hope I can join hands with WeLoveU to implement the UN SDGs in various fields such as education, hygiene, and disaster relief effrots. WeLoveU carries out many different kinds of services, but among them, I actively support their education program. My country has a large population, so we need many school facilities such as elementary schools, middle schools, and colleges. Education has a huge influence on people. We’ve already been supported with Clean Water Project (water pump) by the WeLoveU, and I hope the WeLoveU will continue to work with us to establish schools. The worldwide welfare activities of the WeLoveU are very impressive. As the Honduras ambassador, I’m happy to participate in this great work. 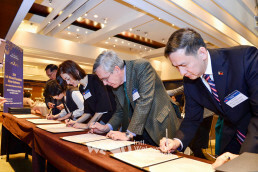 Everybody signed because WeLoveU gives help in various fields that the UN puts top priorities on such as education support, hygiene, and natural disaster recovery work in various regions. 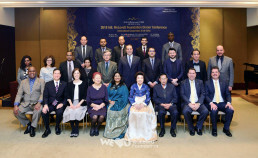 The ambassadors to the Rep. of Korea were greatly impressed by the WeLoveU’s slogan and activities such as educational support in various parts of the world to achieve the UN SDGs, and they also expressed their wish to work in cooperation with the WeLoveU to solve different kinds of problems that their countries are facing. WeLoveU has bound the cooperation of nations more closely to achieve the common goals for humanity, and there is much expectation for the WeLoveU’s activities in the year 2018.